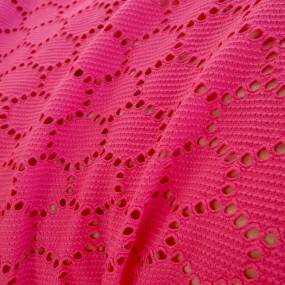 As awesome as this top looks on me, I actually designed it for a flamboyant gay man wearing fur boots at a rave. THIS SHIRT WAS MADE FOR A RAVE! Now when I brought it to work Jordan told me she could see 13 year old girls buying it at the mall, but that’s fine too. 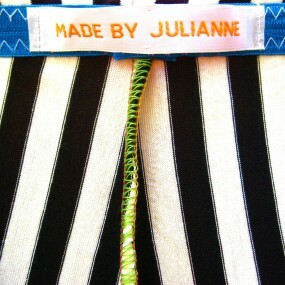 This fabric is so cool! 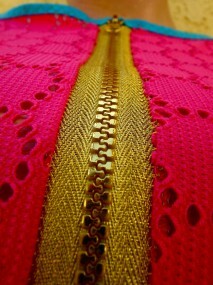 Neon pink mesh with more stretch than you know what to do with, elastic trim at the neck, arm, and bottom, topped off by a bright gold zipper! I’m wearing a tank top for the pictures, but it looks especially awesome with nothing underneath. It’s pure psychedelic psex! You can find it in my Etsy shop. On a personal note, I’m getting a little batty with all this awesome sewing. I can’t look at a fabric without seeing leggings, and between designing, cutting, sewing, photographing, and posting all of these beautiful things I love to make I haven’t had time to make a single thing for myself, and less than 2 months till the burn! Not that I’m complaining, because I really love what I’m doing, but at some point I need to make a costume for myself! This dress makes me think of Nancy Drew and pumpkins. Orange + plaid = vintagey fun! And doesn’t Cassandra look like she’s having fun modeling it? 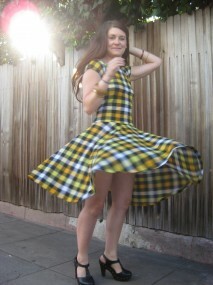 I love making dresses with circle skirts, because it makes grown up ladies twirl and dance! Plaid’s an unusual choice for me, but the fabric itself is right up my alley: light-weight cotton jersey with great stretch and beautiful draping. There’s only one dress left in my Etsy shippity shop! Get one so you can start making pie and solving mysteries! I’ve said it before and I’ll say it again: leggings are great! Wear them with your costume to keep you warm on the playa, or put them under a dress for going out to dinner. They don’t take up a lot of space, are comfortable to wear, and can go with anything. Check out these leggings and more in my Etsy shop! All these pictures are of my friend Svetlana, who does aerial silk and is a fantastic model! By the way, in case you missed it I’m included in the 2011 Burning Man Resource Listing! It’s been a great motivation to make a variety of costume pieces and actually post them, and all that work is actually starting to pay off. 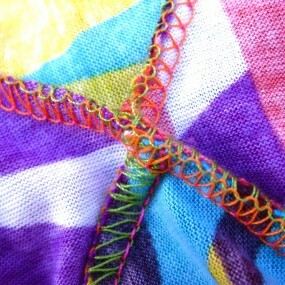 I’ve also joined the Etsy Black Rock Crew to network with fellow crafter-burners. It takes a lot of time and effort, but it’s so exciting to see my little business grow.